Time Barred Claims – When Is It Too Late to Sue Under GBL §349? If the validity of a settlement is in dispute, one test is to check whether the settlement was made in court or in writing, and whether the court conducted an allocution. 505 Eighth Avenue, 14th Flr. I have been an attorney since 1989 and have trained in the martial arts since 1984. Both fields share the same model for success: Avoid confrontation. Fight fiercely when necessary. Think creatively. Negotiate from strength. Overcome weakness. Pay rigorous attention to detail. Show courtesy and respect. This blog is an exercise in free speech. Under NY rules, this blog may be considered an advertisement. Every effort is made to ensure that it is accurate. You agree and understand that the information here is not legal advice. Laws change. Facts vary. This blog may not reflect current legal developments. No attorney-client relationship is created by reading or commenting to the posts here. You must consult with an attorney who can determine how the laws apply to your particular facts. Please feel free to e-mail Scott about your situation or to inquire about retaining his services. 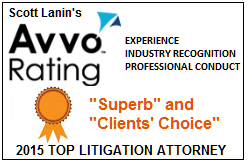 Scott's firm, Lanin Law P.C., represents a wide variety of businesses and individuals.